Looking for some clean garden fun? 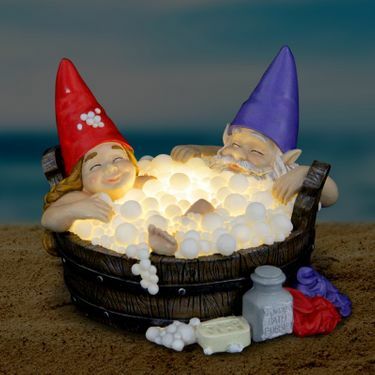 Rub a-dub-dub, two skinny-dipping gnomes relaxing in a solar bubble bath tub! Staying in this wonderful bubble bath all day and night with a solar powered LED light, who can blame them? It's hard work in the garden all day long! These adorable good time gnomes are certain to add a touch of whimsy to your garden and a smile on your face! Size: 8.75" x 8.75" x 6.75" H.